Rev your engines and get the sand out of your tailpipe. Rocket League, which is nearing its third birthday, has been a steady outlet of seasonal content since release. Almost every update brings with it new skins, toppers, and decals to unlock, and this summer's update is no exception. That's not all, though! Alongside the start of Season 8 of the game's Ranked mode, the "Salty Shores" update brings with it a brand new arena named, you guessed it, Salty Shores. 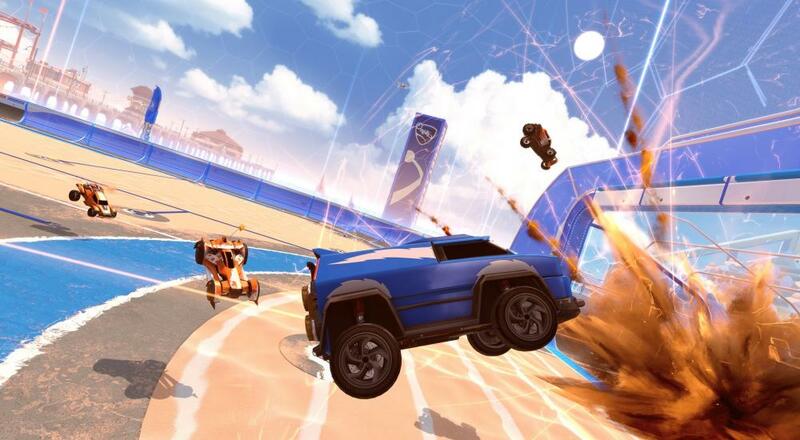 Developer Psyonix claims that it's their "sunniest map to date", which probably also means that it's the hottest. I most certainly do not envy those poor drivers, sweltering in their turbo-infused cars. Let's hope nobody has leather seats. The "Beach Blast" event runs from June 11th to July 2nd and will likely involve a new breed of unique token to collect and subsequently spend on beach-themed items. Events like these are especially fun for folks like me, as they give us something new to focus on besides the fact that we've been floundering in the same two ranks for oh, say... the last year or so. Rocket League allows 4 co-op partners (both local and online) to take on the game's AI, which can be adjusted to suit everyone's ability level. It's available on every modern console as well as PC. If you're interested in picking it up, you can check out our original review for it here.